A violent volcanic eruption in Japan that forced the evacuation of an island appears to have come to a halt, the country's weather agency said Saturday. 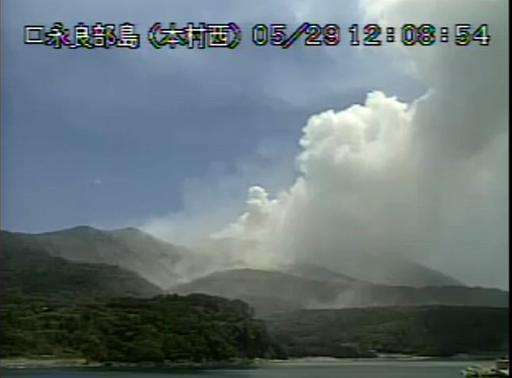 The announcement came a day after Mount Shindake, which sits on the far southern island of Kuchinoerabu, sent plumes of ash up to 9,000 metres (29,500 feet) tall shooting into the sky. Television pictures showed the after-effects of the eruption, as ash and rock cascaded down the mountainside towards one of the island's harbours. Grey sediment blanketed the breakwaters and discoloured the sea. The eruption forced all of the island's nearly 140 inhabitants to flee, with one elderly man having suffered a minor facial injury. The Japan Meteorological Agency said Saturday that volcanic activity at the site had calmed for now. But it is unclear whether this will remain the case, the agency said, maintaining its volcanic alert for the peak at the highest level. On Saturday morning, smoke was observed at a height of 200 metres above the volcano, a level seen before Friday's major eruption, Japan's Jiji Press agency said. Some of those plumes were measured at 9011.5 meters.